You see groups and get basic information about them. If a group administrator decided to hide a group, you will not be able to see it unless you have been invited to it. Groups I can join. This is the default value and only shows those groups that you are not a member of and that you can join. Thus, it does not show any groups that have controlled membership. Groups I’m not in: This shows all groups of which you are not a member. Groups I’m in: A list of all your groups. This is the same list as you can see on “My groups”. All groups: Display all groups no matter whether you are a member of them or not. Group category: You can limit your search results to a certain group category if group categories exist. clicking on the group name to see the group homepage. clicking on the name of the group administrator to get to their profile page. clicking on the member link to see who is already a member of this group if the administrator discloses this. 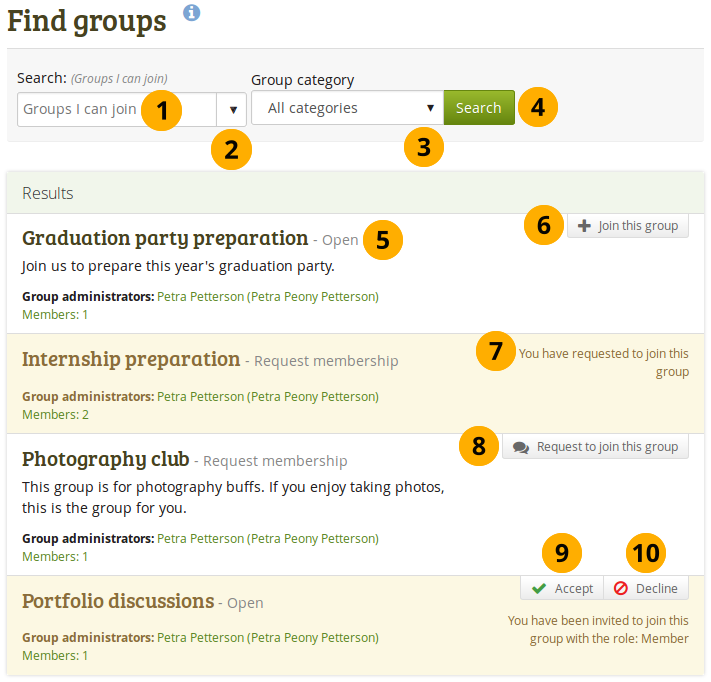 Users who are staff or administrators in Mahara can hide groups. Thus, you may not be able to see all groups that exist in the system. If you want to become a member of an open group, click the Join this group button, and you will be a member immediately. If you already requested to become a member of a group, you see this mentioned and have to wait for the administrator’s approval. If you want to join a group that needs the approval of the group administrator, click the Request to join this group button next to the group. The administrator will receive a notification and decide about admitting you to the group. Usually, you do not see forums, group pages, group collections and group files unless you are a member of a group. If a group is publicly available, you do see the forum discussions.